I was rolling through the numbers and statistics of Utah caches, and all the work I have been doing. I have not updated my stats page yet, but here is what I have. What is surprising is this year is with a second reviewer. My first year I averaged about 14/day, this year 13/day. But once again, two reviewers since last fall, and a busy May is still to go that I would guess will push that number up. The total is a total of 2400 new caches in the state, we are approaching 21500 now. So many so fast. I think we are seeing an increase in all types, back country, desert, city, and trails. A mix of them all. I remember starting and thinking, man there are a lot, and that was then. Another idea of how much work we do is the number of notes we leave on caches. My first year I listed 1200 notes, I am at 1100 now. 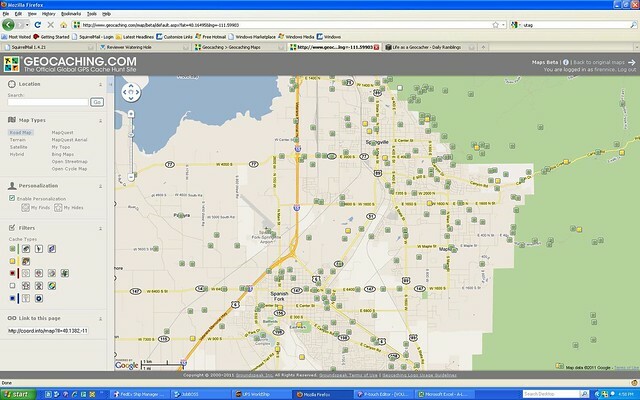 Those are almost all caches that we are working on. Caches that we respond to issues with, not counting emails, that i don't track. In all, it is busy and fun, and only getting busier. I will update my stats soon. Enjoy all. Today was the date of some new updates for those that were interested. There are plenty of map options. I really like the topo option. The two shots show some of the difference if you sit down and use the filters that are available. The upper map is everything on. I then turned off the caches that I had found and that I own... then shut off puzzles and events. That leaves me with a good list of what I can go after, tonight on the way home. You can also now click on the blue favorites ribbon in a search or on the cache page. It will tell you what percentage of premium members that have found the cache have listed it as a favorite. I would personally like that a sortable column, but this is an improvement. The most popular % wise (with those 7 votes or higher) In fact this was the only one over 30% with over seven votes. You can list out your milestones. You can have the website generate them, or you can correct them yourself. I think this is new. Now when you do a search, or go to someones profile there is an info column. In the past that column mentioned if it had geocoins, or travel bugs in it. Now it will also show the premium member icon, and an Icon for Needs Maintenance. So you will be able to see before you go if it needs maintenance. If I look for one that needs maintenance, I may take a few things (logs, container), or not go at all. They have been discussing these changes for some time, in some cases for a long time. Ideas were tossed around and off they went. Then a few months ago the reviewers had a sneak peak at some of the ideas, and others we were told what direction they were going. More ideas were tossed around, and now we are coming to a culmination of what I would imagine is 6-8 months of work on the projects. There will now be a new page on your profile. 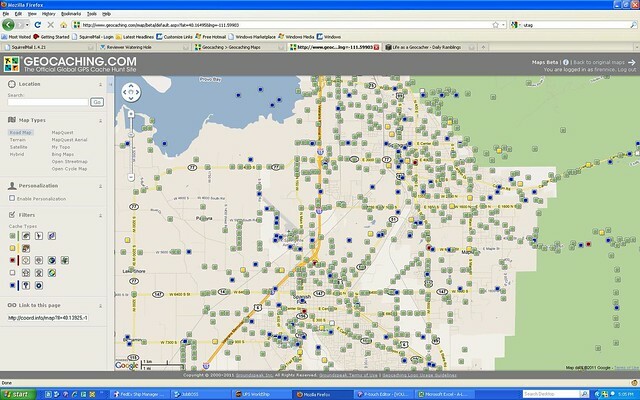 It will house geocachings new stats page. This will be a compilation of a number of the commonly gathered stats. There are plans to make more additions to this, but this is the initial roll out of the information. You will be able to hide your stats if you wish, but the default is a planned "on". It will be tied to the Premium Member feature, and I am seeking more info on that. I should know soon. The stats page will look very familiar. We see many of those out and about now. This is really cool, really cool. Did I mention it was cool? When I first heard of it and saw the link to a movie I kind of ignored it. After hearing how cool it was I went and actually pulled up the video. A photo/screen shot cannot really do it justice. The biggest change....... wait for the drum roll please...... No more 500 cache limit. Actually the limit will be infinite. You could (in theory) see all the caches at one time. The maps are larger, and far more dynamic. Zooming in and out looks very smooth. Much more than the one we use now and especially when you get to 400 caches now it is very choppy, but with 3000 it looked smooth. :D woo hoo. This is a huge change for the site. Where the other steps make the experience on the site very useful. This is a game changer in how you may actually look for caches. Based on the number of finds you will get a favorite point. These will be earned by finding caches. Woo hoo, finding caches give you points.. everyone likes that. Except now a you will be able to award points to your favorite caches. The problem with many averaging systems is people. I may rate a persons find high because he is my friend, or I love all power trails so I rate them high, or mountain peaks, I may even love LPC caches, or quick finds. Other people may hate my cacher friend, power trails or LPC's, and only love those that challenge. In essence votes start to cancel others out. You never see a 1 star or a 5 star. or even a 1.5-4.5 if many votes are given. they tend to all end up in the 2-4 range, and over time a 4.5 star cache degrades, and cache quality also. The system quickly becomes useless. Now you can take the points that you earn, and donate them to your favorite caches. On a cache page you will have the ability to add your favorite points to caches, and take them away. You will be able to go to the page and see who liked the cache. Your page will tell you where the points are, so you can go back and reclaim points if you find better caches, or when you realize that a LPC, or nano cache is not really your favorite. Last but not least you will be able to sort by favorites. Look for those that others found most excellent. Premium member. that is the magic word that I did not mention much. Most of these functions are going to be available to premium members only in varying degrees. Premium members will be able to give favorite points (to avoid spamming the site with fake logs, and likes). I do think this is a game changer. You can only give them to caches you have found. So once a cache is found you can mark it as a favorites. So start dusting off the cobwebs from your mind. Think of the best caches you have visited, so you can mark them, and then you can find them on the new map while checking your fantastic stats. On a quick follow up. Some skimmed over my opening note where i mentioned the changes were due in the next few weeks (before Christmas). The site upgrade on the 14th had more to do with the site hardware, and some other upgrades not the monthly website upgrade. For those of you who are stats Junkies I added the stats for Utah, and for myself. They are under the Title Navigation on the column to the left. These will give you an idea of how things are changing for me and the state. Or just be a great bunch of stats to pass the time staring at. Increase of 3,600 active caches in the last 12 months. I am publishing 21 per day this year. Last year I was around 12 per day. I have unarchived a lot of caches this year. August and September were my heaviest months last year. Perhaps in July people were busy but not placing. The archived # includes unpublished as well.